Craig Smith Music, based in Lancashire in the North West of England, is run by freelance professional session musician Craig Smith and operates throughout the UK. Craig is available as a live musician; a studio recording session musician; a theatre and film composer / arranger; a live touring band and theatre musical director; and an advanced level private music teacher. In recent years, Craig has become firmly established as one of the most sought-after wedding pianists and event pianists in the UK, providing well over 100 of his wedding piano packages a year. Craig offers several musical services - find out more below! Craig performs at numerous weddings throughout the year, as a wedding pianist and within duos and bands. He is recommended by several venues. Prices currently start at just £180 for venues most local to Preston, and Craig is available to entertain or provide background music for any part of your wedding day. Craig is available as a session musician and has shared stages with such artists as Tinchy Stryder, Paloma Faith and Pixie Lott as well as recording for Bryan Adams. He performs with touring theatre companies and in various live original and function bands, as well as recording in UK recording studios. Craig is available as a composer / arranger, composing short pieces for events and composing film, documentary and musical theatre music. He also works as a theatre musical director, conducting and playing for musical theatre and live music shows and tours throughout the UK. Since 2004, Craig has been the number one choice for piano lessons in Preston, thanks to his unbeatable CV, easygoing nature, personalised lessons and ability to put across ideas in a way that makes them quickly understandable. He also works as a school peripatetic piano teacher and provides masterclasses. Craig is available for commission as a composer. The majority of his portfolio is in musical theatre scores, and bespoke compositions for solo piano and various small ensembles for use at weddings and similar events. Craig is also available as a documentary music and film music composer and editor. As well as composing, Craig works as an arranger, and can create a version of almost any piece for any combination of musicians. Want a string quartet to be able to play your favourite rock song? No problem! Craig is available as a musical director in both theatre and for live bands. His most recent theatre jobs as a professional musical director (MD) have seen him direct live music productions in theatres, including The Gary Barlow Live Tribute show and Contempo Productions Ltd's Opera Boys UK tour. His last musical theatre projects included RENT, Footloose (for ATG Theatres), and Jesus Christ Superstar. He is regularly called on by local agencies and management companies to MD live bands for singers looking to showcase their studio work in a live environment, and has also worked in a consultancy role advising managers on the best musical direction to take their younger artists. Through his time as a degree student at the world-famous Liverpool Institute for Performing Arts, and his subsequent live and recording session work, Craig has an extensive list of professional session musicians on whom he calls when pit musicians are required, guaranteeing a high quality of performance on any project he directs. Craig performs regularly across the country with several bands and artists; recent high profile gigs include support work with Paloma Faith, The Noisettes and Tinchy Stryder, plus a recording session on a Bryan Adams track. He specialises in musical direction and musical supervision, and is currently touring within the band for Contempo Productions Ltd's classical crossover Opera Boys UK tour, and as musical supervisor on Soundsmiths Promotions Ltd's various theatre and live music products. Craig is a popular booking as a 'dep' and session musician and he also performs as a pit musician in theatres. Craig has been established as one of the North West's top wedding pianists for a number of years. 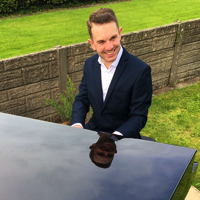 He most regularly plays piano at Eaves Hall as a Mitton Hall wedding pianist, and is available to play wedding piano at all Ribble Valley and Lancashire wedding venues. Other regular wedding venues include Bartle Hall, Samlesbury Hall, Mytton Fold, The Inn at Whitewell and many more! Craig is also available to play wedding piano in Cheshire and Lake District wedding piano jobs form a large part of his work. Craig performs solo wedding piano music at weddings most weeks of the year through Dream Day Music, as well as working in wedding bands and with popular acoustic 'Live Lounge' singer Kate Torevell in Acoustics By Kate. Craig and the other musicians he performs duos with perform wedding music throughout Lancashire, Merseyside, Greater Manchester, Cumbria, Cheshire and West Yorkshire. Craig is available for both wedding ceremonies and receptions playing classical, swing, pop or soul music, or any combination of these. He has performed at most of the region's hotels and halls. Craig was trained at the acclaimed Liverpool Institute for Performing Arts (LIPA), co-founded by Sir Paul McCartney (from whom he received his BA Music degree, with first class honours). He had top-class tuition from renowned practitioners in record production, composition, arranging and both solo and ensemble performance. Offers of work in Europe, The United Arab Emirates and The United States followed. Until 2011, Craig had a remarkable personal client base, providing around 105 piano and keyboard lessons per week, before taking on other teachers through his Tuition Agency. He reduced his own teaching hours to pursue opportunities in live music and composition, and his regular tuition is now mainly limited to a day of peripatetic tuition at Garstang Community Academy and a select few private students, studying advanced piano lessons in Preston, plus keyboards, theory, composition and music technology. In addition to the above, Craig provides masterclasses and 'guest lecturers', mainly aimed at young adults seeking a career in music and the arts. These can be delivered as lectures, practical classes or a combination of the two. Subjects include "The Portfolio Artist" (highlighting the importance of becoming proficient in several disciplines) and "Marketing Musicians" (the use of technology to secure more work), to "Natural Drum Programming", a hands-on masterclass for producers and musicians on making authentic, human sounding midi-based drum tracks, and "Creating Groove", an exploration of more creative rhythm section playing. Private tuition in beginner adult piano lessons and keyboard lessons to advanced piano lessons is available, and Craig also works as a music theory teacher, music tech teacher and composition teacher. Kids beginner piano lessons are available, but the demand for his services means that evening vacancies only rarely become available. In addition, Craig works as a musical supervisor and consultant for several local and national agencies, venues and production companies. Craig performs as a regular member of popular Merseyside band Jessicas Ghost, and as a session musician for Acoustics by Kate. Craig also works as MD or within the band on live band tours and theatre tours, and takes "deps" with other bands and acts, standing in for other musicians. Read lots more about Craig's current and past projects on the Biography Page.